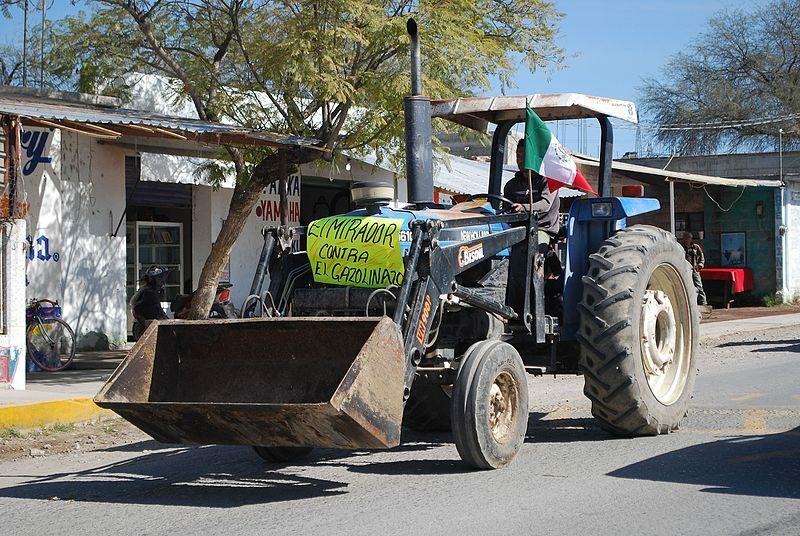 With the increase of gasoline prices in Mexico, social unrest  has spread and people are making themselves heard everywhere they can: on the street, in coffee shops and all across social media. The latest hike in fuel prices  – known as the gasolinazo – went up by about 20%  virtually overnight on January 1. This spurred daily protests in the streets and online. During these protests, Twitter has served as both a megaphone and a platform from which people can show their anger and discontent. However, friction and conflict have increased on the site, as well as the propagation of false stories. 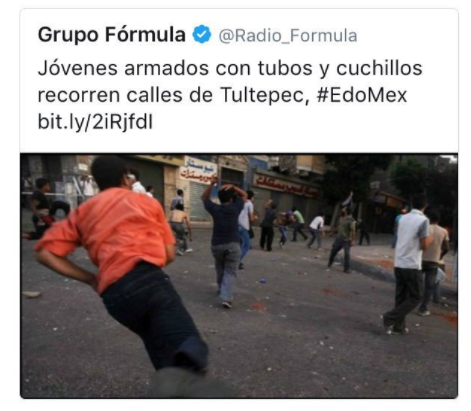 “Youth armed with pipes and knives running through the streets of Tultepec, #EdoMex” Deleted tweet from Grupo Formula, accompanied by a photo from Egypt, in which Arabic writing can be seen in the background. One of the most important phenomena that has been observed in this fight is the circulation of rumors and hashtags that promote illegal activities such as looting and theft. These strategies two objectives: to influence the conversations and to delegitimize the protests. Alarmist messages have even been shown alongside photos from other contexts and situations, such as the deleted tweet displayed here, published by Radio Fórmula  with a photo that fact-checkers later confirmed depicts a street scene in Egypt. Some of the accounts involved in these disinformation campaigns have been identified as bots (automated accounts) or trolls who had already been linked to harassment and threats against journalists and social activists. The strategy of these accounts is to reshape the natural online conversation via trending topics, interfering with the discussion. This kind of strategy has been used at different times to systematically curb or modify conversations that are not favorable to certain groups in power. During the protests on January 4, 2017, two hashtags were used, #Gasolinazo  and #SaqueaUnWalmart  (Loot a Walmart), which grew to be trending topics in Mexico. The following image shows the relationship between different hashtags found in the tweets published on that date. The links between hashtags represent the times when two or more hashtags were used in the same tweet, and the size of each node shows the number of times each hashtag was used. This analysis was generated using more than 15,000 downloaded tweets, posted and re-tweeted by more than 10,000 different accounts. Here we see the importance of #Gasolinazo and its relationships with the rest of the hashtags used that day. The appearance of #SaqueaUnWalmart can be read as a cluster in the system, an unnatural insertion that links up with #Gasolinazo in order to gain momentum and invade the natural conversation. The diagram also allows us to identify other hashtags associated with #SaqueaUnWalmart, which gives clues as to the strategy used to enter into the conversation. Specifically, the hashtag #Hail100cia (a play on words meaning “hail ciencia” or “hail science”) stands out. This hashtag is associated with the group of Twitter user accounts that coordinated the appearance of #SaqueaUnWalmart and has continued pushing forward new hashtags such as #GolpeDeEstadoMX  (State of Mexico Coup D'état). In order to identify the real influence of the hashtag within the conversation, the accounts that were active with both tags were analyzed and graphed. This allows us to see who is posting messages and who their audience is. The following graphic shows these relationships. 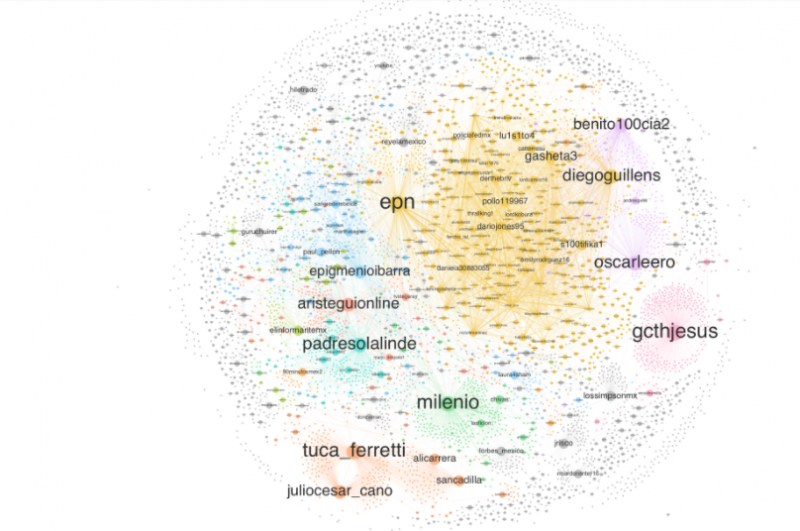 The size of the nodes depends on the number of times a user is mentioned within the conversations with the hashtags #Gasolinazo and #SaqueaUnWalmart — the more mentions, the larger the node. The active communities range from traditional media who reported on the hike in gas prices, to particular organizations — in this case the group that instigated the #SaqueaUnWalmart hashtag. 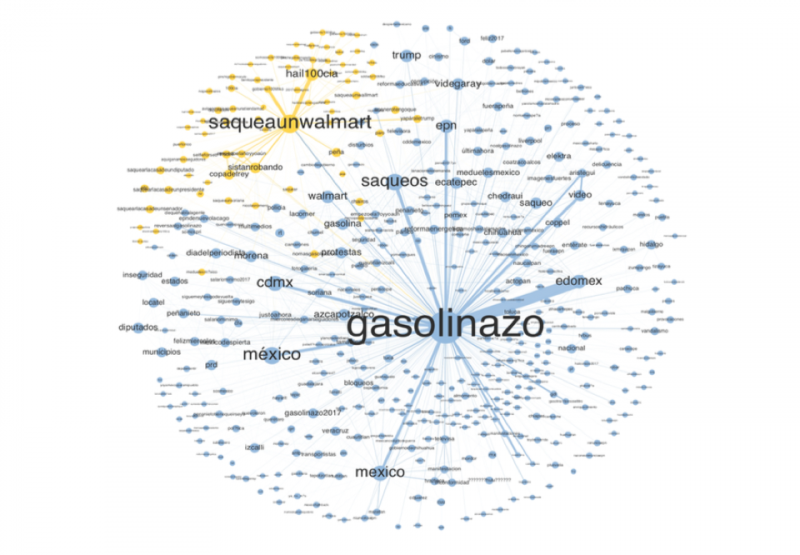 At first glance it is difficult to see the relationship between said accounts within the many active accounts who adopted #Gasolinazo, but as the following image shows, the #SaqueaUnWalmart group managed to link themselves up with #Gasolinazo to position their hashtag as a trending topic. 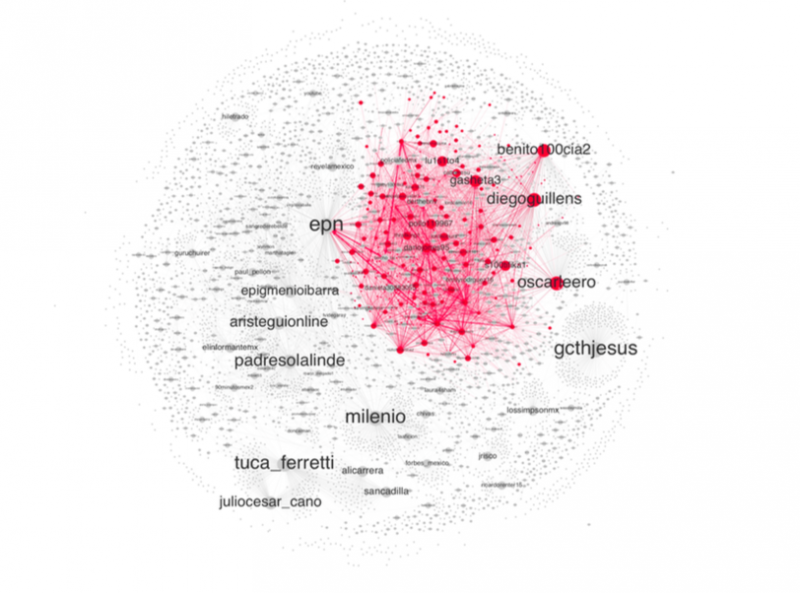 The community highlighted in red in the above diagram identifies the group of active accounts that used the hashtag #Hail100cia. This is the same group of users (trolls and bots) that interrupted the natural conversation surrounding #Gasolinazo to insert the #SaqueaUnWalmart message. This group represents only 4.19% of the total active accounts (5,302 in total used the tags #Gasolinazo and #SaqueaUnWalmart). However, despite their small numbers, their attack through the use of replies and mentions managed to boost #SaqueaUnWalmart so much it impinged upon the natural conversation. Manipulating trends within a global conversation not only draws attention, but also “pops” or “deflates” the conversation as well as any pressure the real activists exert on the government and/or certain figures. These types of strategies, while not illegal, represent a new challenge in the use of digital spaces for public discourse. Other questions arise after identifying these patterns, strategies and accounts. First, what is the motivation for influencing the conversation in a certain way? Second, what people or groups benefit from this kind of behavior? Third, what are their long-term plans? And lastly, what mechanisms can be developed to curb or mitigate the artificial modification of trends? It is imperative these days to ask the right questions and keep working along this vein. Federal elections in Mexico are only a year away, and the circus of social media could easily become a battlefield between artificial discourse and society, journalists, activists and analysts. And what's more, it could make building a critical, transparent and robust public space difficult.